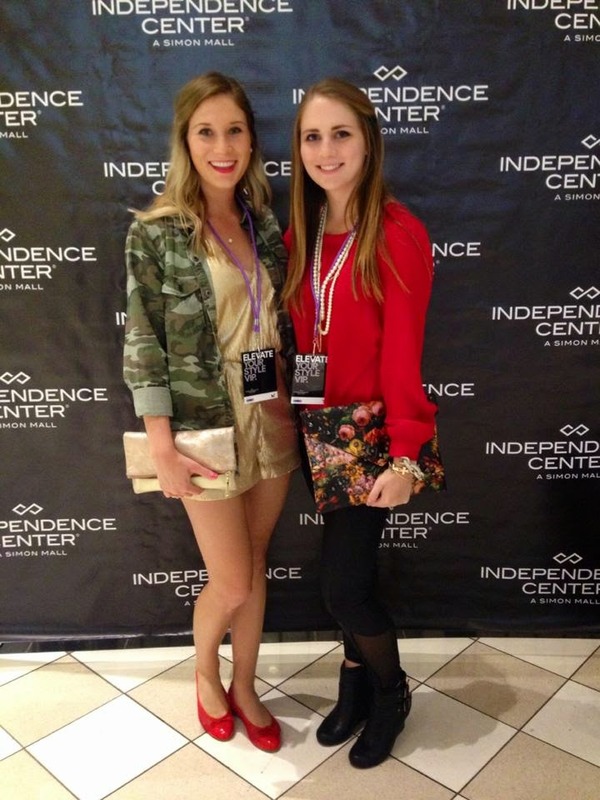 On Friday, I went to the first night of runway shows for KC Fashion Week! It was such a fun night filled with amazing designers. It is hard to pick a favorite designer from the show, and I loved so many pieces! One show that really stood out as a favorite was the Alicia Janesko Caftans and Resortwear. Everything was so unique! She had the most gorgeous swimsuit cover ups with great unique detail. She closed the show with an all sequin jump suit.. swoon! I didn't take any pictures during the event, but this has all the looks! Since it was Fashion Week, after all, I wanted to wear something fashion-forward. A leopard blazer over a jumpsuit with some statement heels was the perfect look! I only attended Friday's show because Tyler and I headed to Milwaukee for a mini-vacay Saturday morning. However, you can read a recap of the kick-off party I was ale to attend here! Thank you to Morgan of Eeny.Meeny.Miny.MOrgan for taking these pictures! Kansas City Fashion Week was last week! It was my first time ever attending and I had so much fun! I only had time to make it two events, but they were such a good time! The first event I went to was on Tuesday night. It was the Media and VIP event + Fall Runway Show. I have never seen a fashion show in person before, so I was super excited to have front row seats! The fashion show was made up of stores within the Independence Center Mall, such as Dillards, New York and Company, Macy's, etc. Take away from the show: I need more hats and jumpsuits. Since it was my first event, I was not really sure what to wear. I wanted to dress Fall appropriate but it was SO. HOT. outside. (It was 80 in KC last week!) I kept the layers minimal and just went with a bright red blouse and leather leggings. I love the ones I have here from Express because the mesh detailing gives them a little bit of edge. (As if leather leggings weren't already edgy enough haha!) I am extremely obsessed with this clutch (evidence here and here) so, of course, I had to bring it with me! Happy Friday, everyone! Today's look is one that I think is so fun because it combines three of my fall must haves: a faux fur vest, booties, and a wide brim hat! I had originally planned to wear this with my brown faux fur vest, but when I was getting dressed decided I liked how bold the all black looked! Throw on some tights and riding boots when it gets a little colder, and you've got a whole new look! Also, this is my first Kendra Scott necklace and I must say I get the hype now! I purchased it awhile back when they were having a sale, but haven't featured it on the blog yet. Mine is actually navy, but the lighting in these pictures makes it look black. It was hard to pick a color... if I purchased another I would probably choose the ivory pearl! Happy Wednesday! When I put today's look on, I instantly felt "country". I think it was the plaid shirt and boots combo. I purchased this plaid shirt last Winter and still love it! My new "thing" is knotting my button downs over skirts, so I obviously could not resist doing it with this look. I think it is so fun! Also, I have to shine some light on my new Tory Burch 'Simone' Riding Boots. I am obsessed! You may remember from my Instagram that I scooped up a different pair during the Anniversary Sale. I ended up making an even exchange for these boots you see here, because I liked the shade of brown better. I loved the 'Eloise', but the brown was so dark it was almost black. I can't wait to wear these more in the coming months! Linking up with Because Shanna Said So. I would like to preface this post by apologizing for the horrible lighting! Tyler and I actually retook these photos twice and no matter where we took them the lighting was just not working with us. That's what we get for trying to take pictures at a different time ;). These were the best out of the bunch, so I hope you will understand. I built today's look around these leopard loafers. They are from BEARPAW, so they are obviously incredibly comfortable! I wanted to keep the look simple, so I went with a neutral palette and few accessories. Monday, we meet again. It is so hard to go back to work after such a great weekend! Mine was full of lots of sports... watching the Royals, the Chiefs, and the Huskers. My mom also came in town to visit! It was a very busy, yet fun weekend. Today's look of the military jacket over a dress seems like the perfect combo of masculine meets feminine. The dress would give off a completely different vibe if it were paired with a blazer and heels. (Also, this dress comes in over 10 colors!) When it is styled with a military jacket it gives it just a little bit of edge. The studs on the clutch also balance out the floral print. Perfect look "in the middle" of girly and masculine. Today I was featured on fellow KC blogger, Morgan of Eeny Meeny Mini MOrgan's blog, for the blog tour! Be sure to check it out! Linking up with On the Daily Express and More Pieces of Me. You all may recognize this skirt from Oasap because I also have it in navy. (Most recently styled here.) This skirt is comfy, and I think the fit is just so fun. Would it be too much to also buy it in black?! At $15, it is definitely a great find! How fabulous are these Steve Madden heels? I purchased them recently to wear to an upcoming wedding, but I could not wait to wear them so I had to bust them out sooner. They are surprisingly comfortable and come in three different colors in cobalt blue is not your thing :). If there are two things you are sure to see a lot of on this blog this Fall they are hats and vests. Vests are nothing new to me, but wide-brimmed hats sure are! I never thought I could pull them off before, but always loved them on other people. A couple weekends ago, I was shopping with my mom and sister and put one on as a joke. I wore it around the store the entire time we were shopping and decided right then and there I needed it. However, I was not a fan of the Express price tag... so I turned to Forever 21! I almost never shop there, but hey... I was a lady on a mission. I scored this hat for less than $10 and now need it in every color possible, please :).